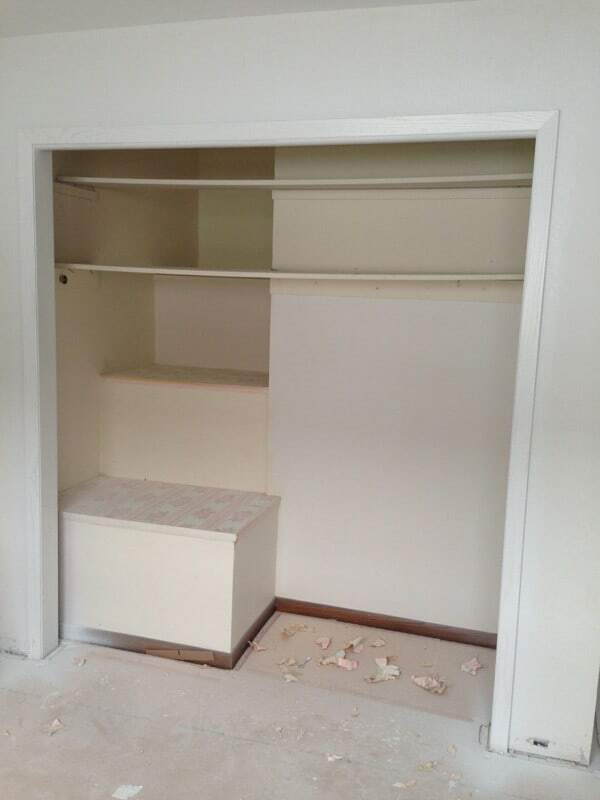 You may remember how we salvaged our Craigslist Cabinets out of a house that was being torn down? 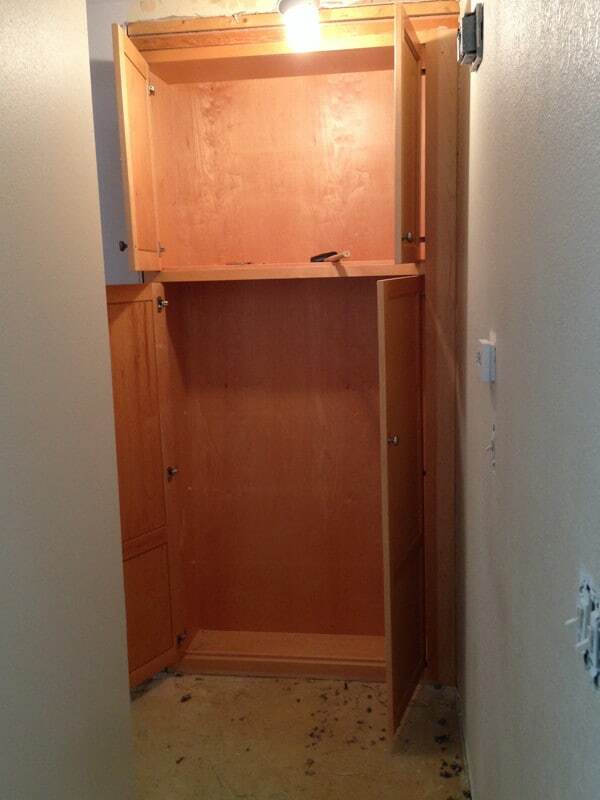 Well one of the pieces that came with them was this giant pantry piece. After my dad and brother-in-law used every ounce of their strength to haul it out, load it up, and deliver it over 500 miles, I had to find a place to use it in our Retro Ranch. 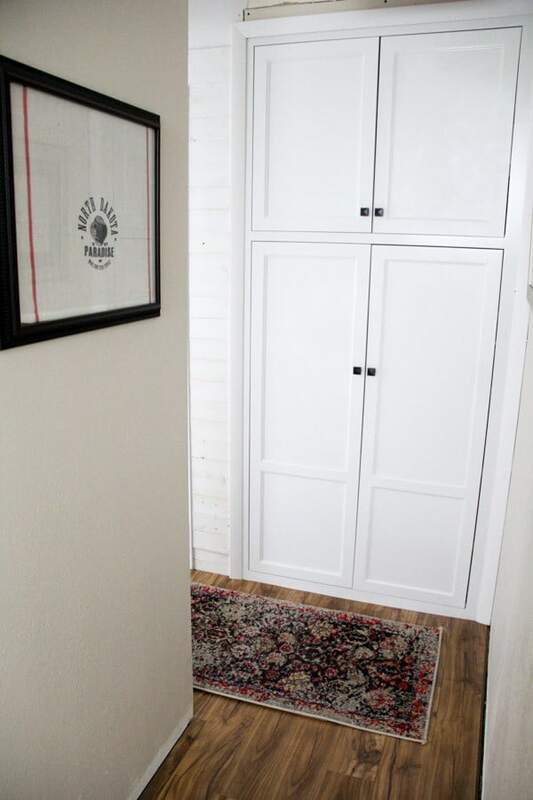 There really wasn’t anywhere in the kitchen, but just down this short hallway I decided I would try stealing space for a pantry from the back of the boys’ closet. So late one night Matt and I got to work demoing drywall, baseboard, and carpet. We had to build a small header to make up for the two studs that we removed. 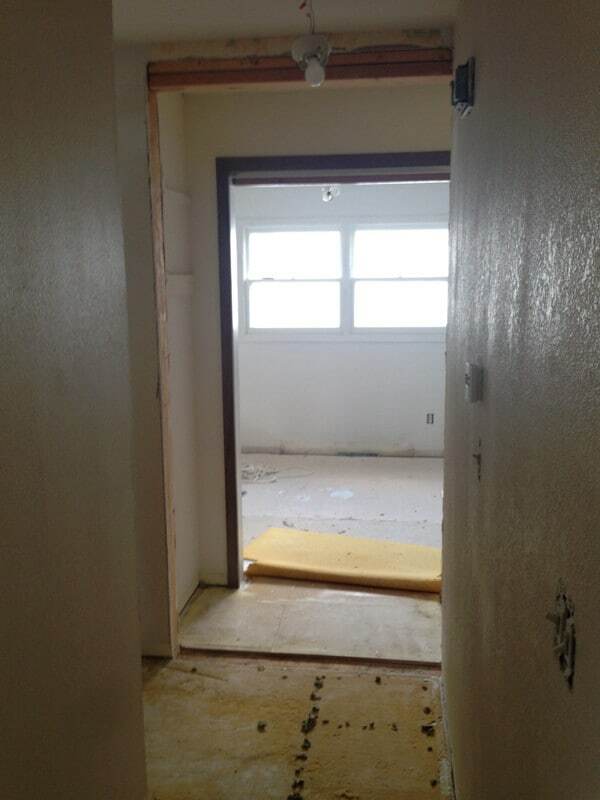 This picture gives you an idea of the proximity of the pantry space to the rest of the kitchen. 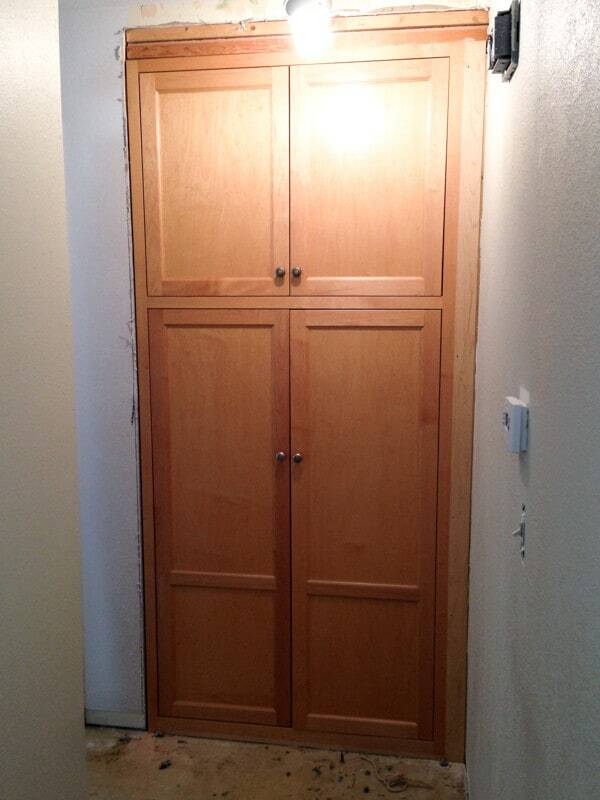 It’s not super close, but it’s not so far away that the idea of a pantry down the hall is totally crazy. Then came the back breaking job of hauling it in and sliding it into place. This was a three person job involving my dad, Matt, and I. 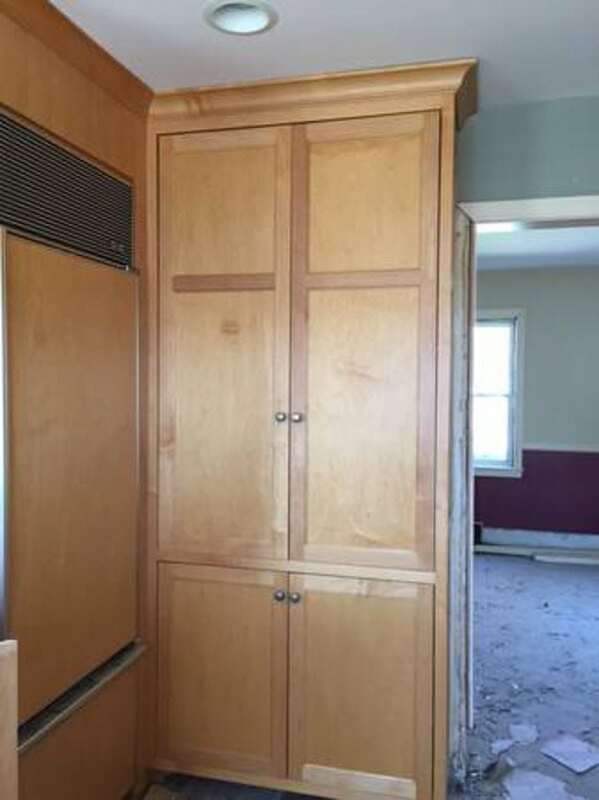 We were lucky enough to get this pantry with our Craigslist Cabinets, but if you weren’t lucky enough to score cabinets on Craigslist, you could do this exact same thing with a cabinet like this, this or this *contains affiliate links*. Once we had it in place I had some work to do, creating a side panel for the pantry, and cutting all of the shelves down to size. Once I got all of the shelves into place look at all of the additional storage that it created. Next I had to create a back panel for it on the boys’ side of the closet. I simply cut this piece of plywood to size and then used small nails to hold it in place. 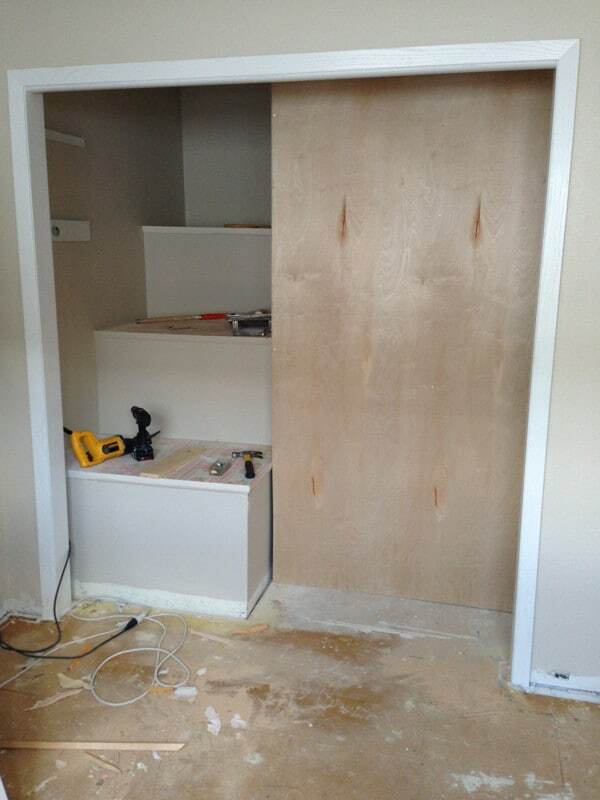 Then I added shelf brackets and created a shelved side to their closet. Although I had to sacrifice some of their hanging space it was well worth it. 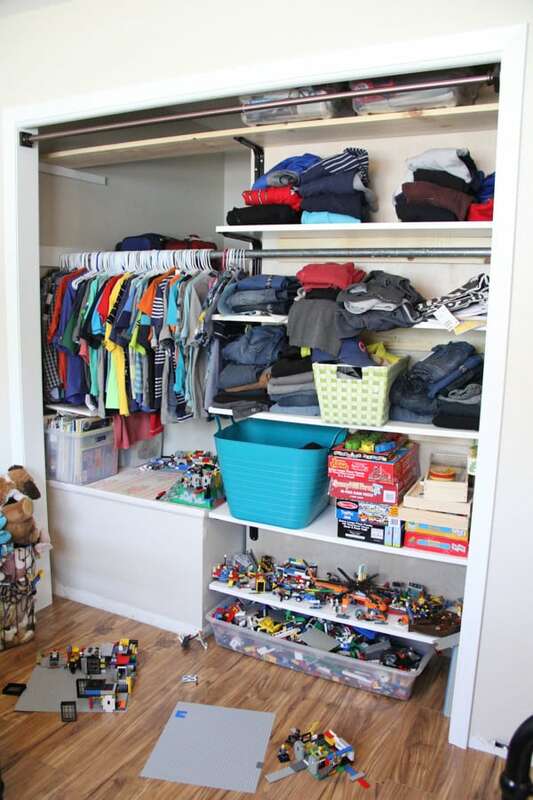 Wouldn’t you rather have a full pantry than a little more hanging space for kids clothes? 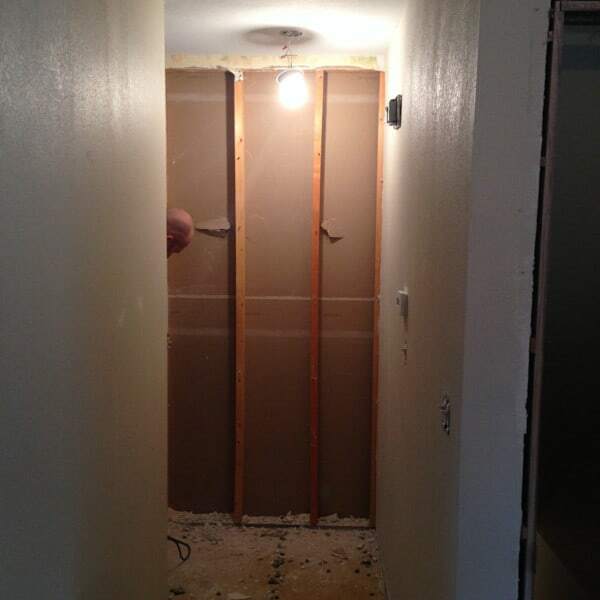 Then it was back to the front side where I did some drywall work and replaced the dated light fixture. 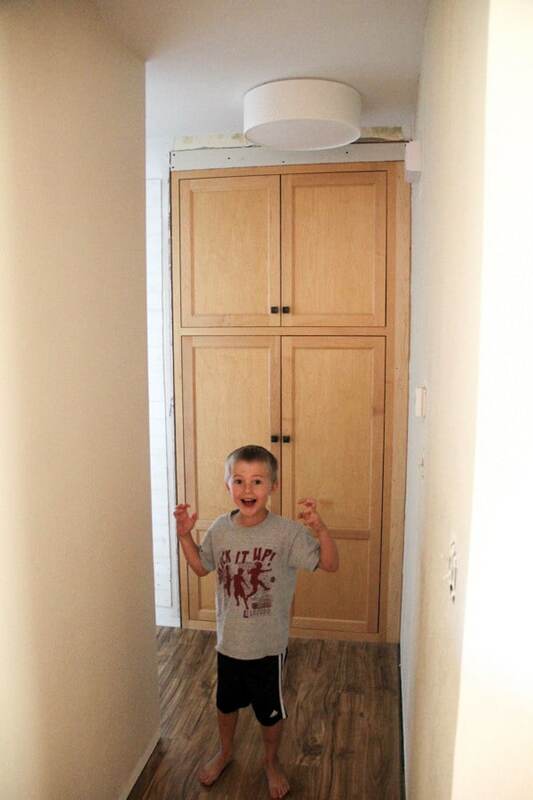 You can see this kid is pretty happy with our final product! Actually I think he was more happy that he finally had all of this food right at his level! It’s definitely not going to make any magazine spreads, but I LOVE the functionality of it! I still have to finish the walls around it, but I am already putting it to good use. 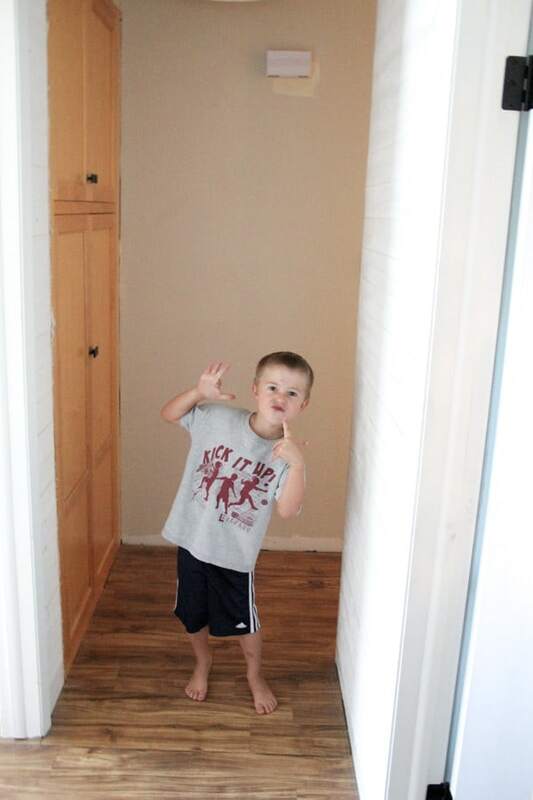 This little photo bomber couldn’t help but jumping in one last photo to share his excitement about our new pantry! 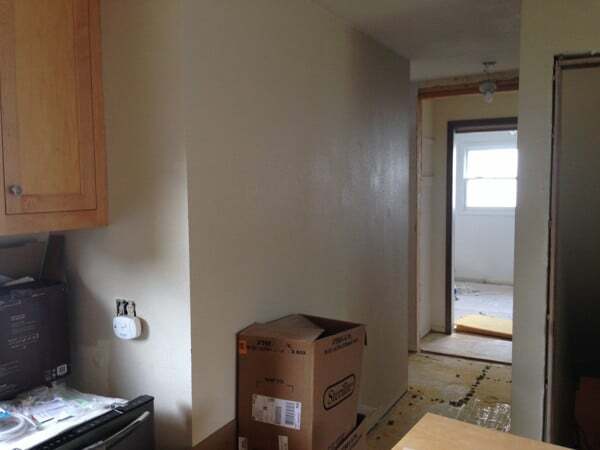 **9/21/15** I painted our kitchen cabinets and painted the pantry too! Here it is one step closer to completion! Our last house didn’t have a pantry either and we found a creative way to make space for one in that house too! 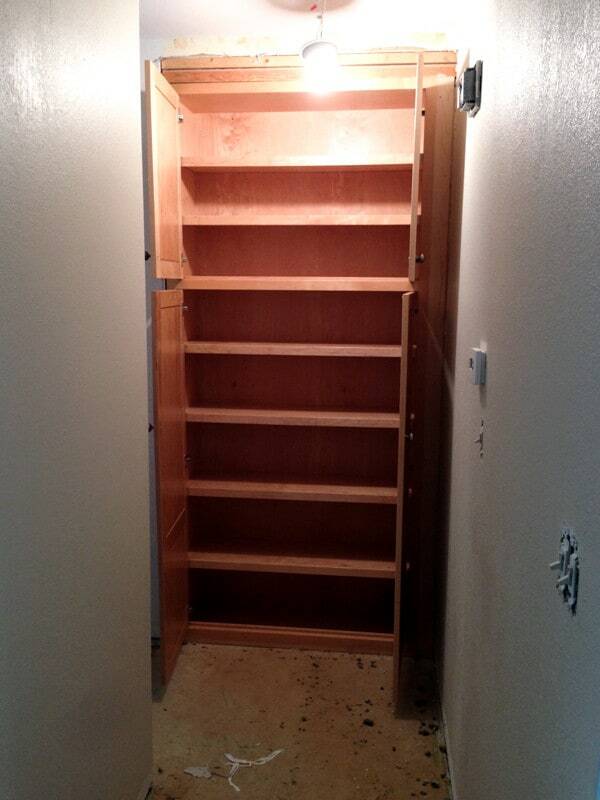 Check out how we built a pantry into our existing kitchen. In today’s world I think that every kitchen NEEDS a pantry. If you’re kitchen is lacking one I want to encourage you to think outside the box and see where you could build one! 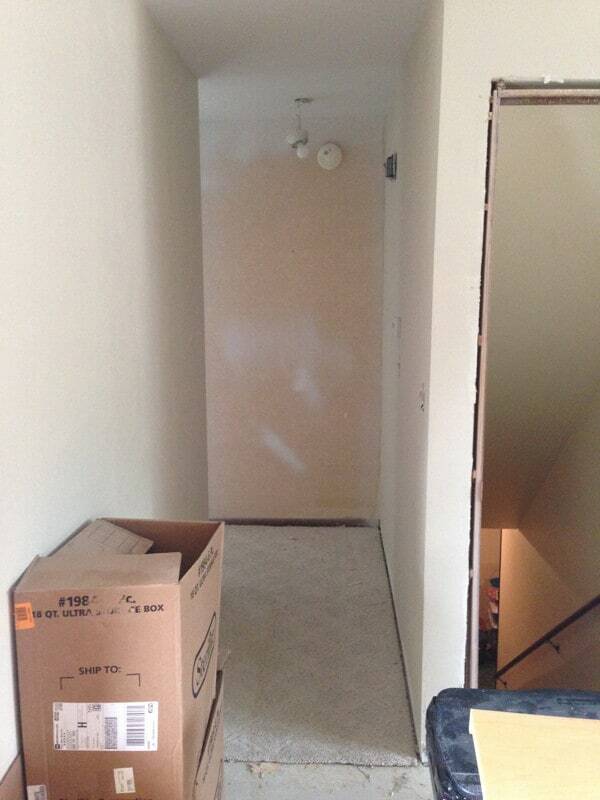 Do you have a hallway near your kitchen? 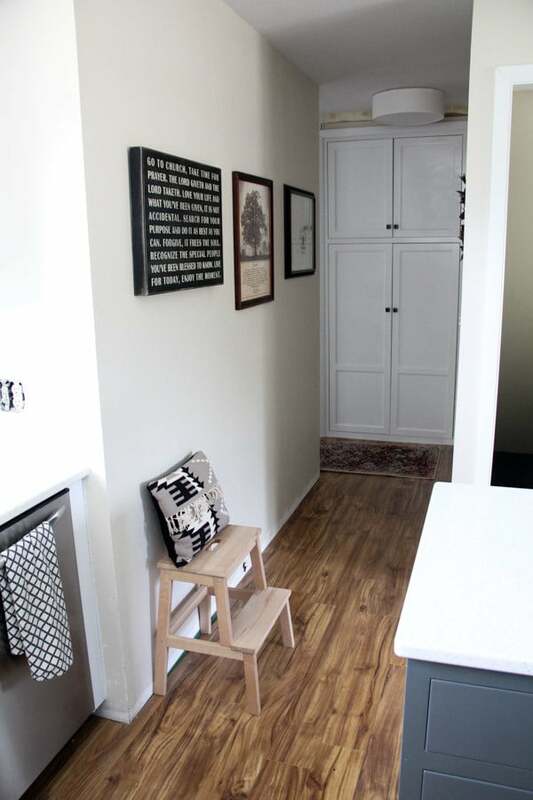 Or does your kitchen back up to a garage you could steal a little space from? 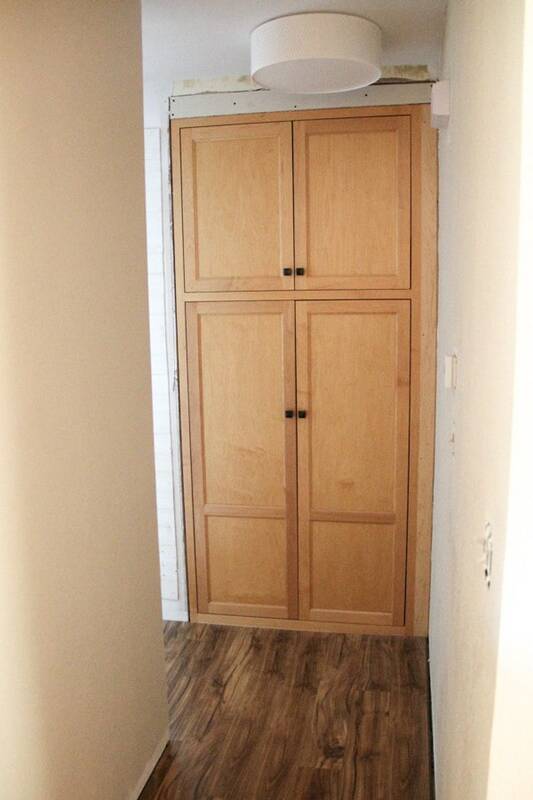 Maybe you could even build a wall of storage in your eat in kitchen like this?! 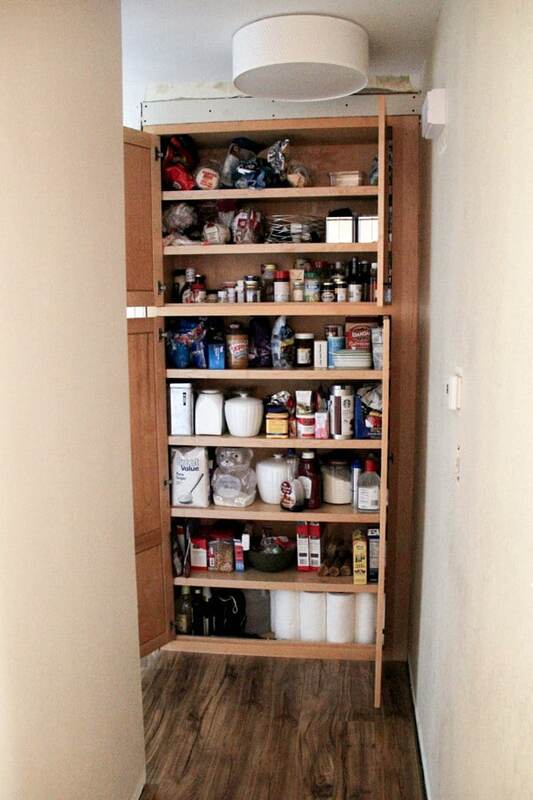 With a little imagination you could have a huge pantry too! Great addition to the house. I rather have a big pantry. Thanks! Me too! Now I just have to figure out a space for their books!